This 72 year old woman lost all her upper teeth due to periodontal (gum) disease. She was not willing to have bulky, uncomfortable denture. The dental implants are in position. Final teeth anchored to dental implants. These beautiful teeth are permanently in place and are not removable. They look, feel, and function like natural teeth, and this individual is able to eat and speak with confidence. In this case, all the upper teeth and several lower teeth are missing. Patient was wearing this removable full denture to replace the missing upper teeth. Note the bulk of this denture that covers the roof of the mouth (palate) and all gum tissue. Patient was very unhappy, uncomfortable, and embarrassed with the denture and wanted to have a more natural replacement for his missing teeth. This Pre-operative x-ray shows the missing teeth in upper jaw and lower left side of the mouth. Because teeth were lost many years ago, Patient had extensive bone loss in both dimensions (height and depth). A bone graft was done to restore the lost bone. Missing teeth were replaced by placing 8 upper and 3 lower dental implants. These teeth are permanently in place and feel, look, and function like natural teeth. Another view of permanent teeth in place. These implant teeth are anchored to jaw bone and firmly in place. They are supported by bone and gum just as natural teeth are. The palate is not covered and the patient can eat, talk, and speak more naturally. This patient’s life is greatly enhanced because he does not have to use his old embarrassing denture. Call Dental Implant Centers at 866-4my-smile to discuss your dental condition andh explore options to have a great smile. This case demonstrates replacement of a removable full lower denture with permanent, fixed implant teeth. This 62 year old patient lost all his lower teeth recently and was wearing this lower denture transitionally during the course of implant treatment. This type of denture has traditionally been used to replace missing teeth. Patients who have to use this denture are generally dissatisfied due to its bulk, lack of retention, ineffective chewing power, inability to eat a complete diet, interfering with their speech and other problems. Many such patients prefer implant retained fixed teeth to enhance esthetic and function. This X-ray shows implants and the fixed bridge. This picture shows the final teeth (bridge) in the mouth. These teeth are held in place firmly by implants, as natural teeth are held by their roots. Eating with these teeth is as enjoyable as natural teeth. Another view of final teeth show their perfect adaptation to gum. Unlike dentures which are artificial teeth, implants offer a natural replacement of lost teeth. If you have missing teeth and/or denture problems, you might be a candidate who can benefit greatly from dental implants. Call Dental Implant Centers at 866-4my-smile today and arrange a complimentary consultation to explore your options to have great teeth and beautiful smile. I had been interested in having implants for several years, but kept putting it off because of the fear they would not be as good as advertised, and the expense, since my insurance did not cover the cost. 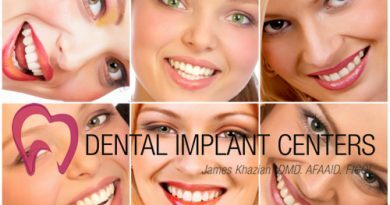 When I finally got serious about implants I started investigating dental offices that had extensive experience in that field. I wanted one dentist to do the entire process, from extraction to finished product. I even drove by offices that I was considering. My investigation paid off in Aces. I found you, Dr. Khazian! I scheduled an appointment and immediately felt comfortable. When I asked if my wife could also meet with you, and she did, she also immediately felt the same way. In a few months I had 6 implants and a new bridge, beautiful new teeth. Biting and chewing everything from hot dogs to steaks, it had been a long time since I could do that. The Dental work required several appointments and a lot of hours; but the entire procedure was less painful than root canals or other dental work I have had in the past. Thank you, Dr. Khazian and your staff for being very capable, competent and caring; — It has been my pleasure.